Today's challenge is Elf. I know the all the craze about Elf on the Shelf and I have seen some really creative photos of them. And I've also seen Mensch on a Bench for us Jews. Fun, but way too much work for me. Another elf I considered drawing is Hermey from Rudolph the Red-Nosed Reindeer movie. Yes, I still watch it every year with or without the kids. 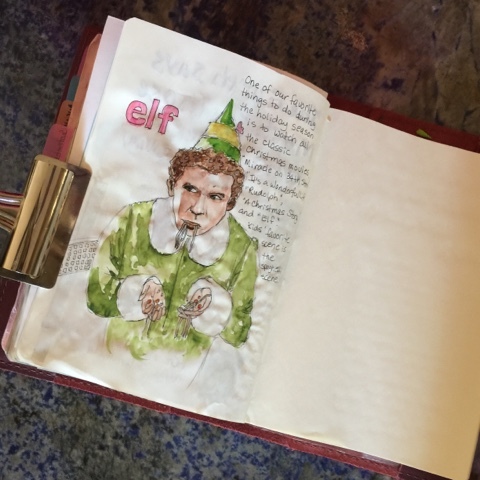 So the elf that drew is from the movie, "elf" with Will Farrell and James Caan. And the scene is when Elf is eating spaghetti with syrup and candy and is barf-worthy but kids always love that scene wondering how Will was able to eat the concoction. We don't celebrate Christmas unless we visit my sister and mom, but we love so many of the Christmas movies and songs. Which movie is your favorite holiday movie?